Essar Air Systems, India's leading Pulse Jet Bag Filter Manufacturers , Suppliers and Exporters, offering pulse jet bag filters, dust collectors, seed coating machines and many more for several industrial applications. Pulse Jet Bag Filters are versatile and specially designed for exceptional separation efficiency at a high ratio and long functional life. The pulse jet bag filters are highly appreciated for excellent performance, great collection or efficient filtration. 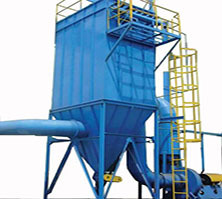 Pulse Jet Bag Filter is highly demanded in the industries for providing clean air. Pulse Jet Bag Filters are offered in two main models as Online and Offline. The online pulse jet bag filter is specially designed for low to medium gas volume, while in offline pulse jet filter employed a larger gas volume. While cleaning jet bags, the gas flow to a compartment of the filter is stopped temporarily. At the same time dust dislodged from bags and settle down quickly in the hoppers. Filtering the gases as usual and even there are many other compartments are active during the cleaning process. Automatically, each and every compartment in the filter is cleaned one by one with a sequence controller.